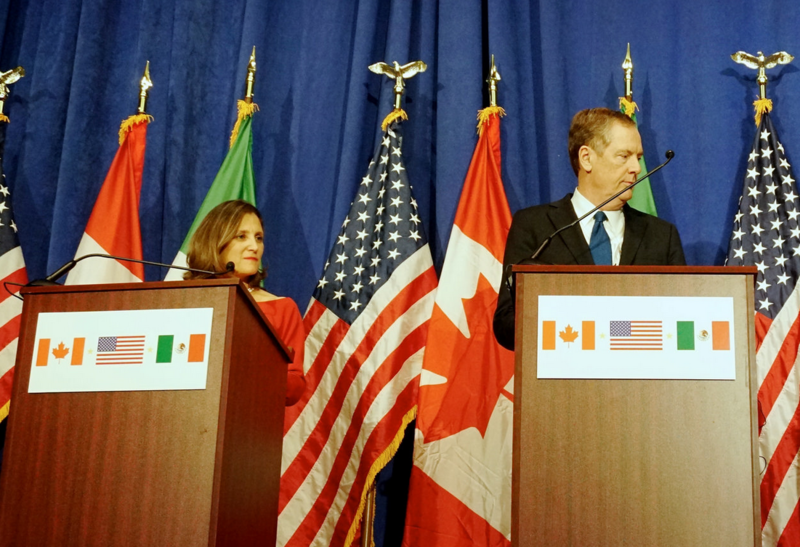 Foreign Affairs Minister Chrystia Freeland and U.S. Trade Representative Robert Lighthizer (photo courtesy U.S. State Department). Strong-arm tactics have always been an ugly feature of Canada-U.S. trade negotiations. But in the current NAFTA renegotiation the Trump administration has taken bullying and brinkmanship to a whole new level. The Canadian government was thrown off balance by the U.S.-Mexico deal announced in late August and has been playing catch up since. On Aug. 31 the administration formally notified Congress of its plan to sign a deal with Mexico, and “Canada if it is willing.” Under fast-track timelines, the full treaty text must now be sent to the U.S. Congress by September 30. That means the train has left the station and Canada has a few weeks at most to decide whether to get on board. Even if an agreement in principle between Canada and the U.S. is announced within the next few days, it would be followed by a frantic sprint to finish the full treaty text by the end of the month. Canada has been under intense pressure to make irreversible concessions affecting a broad range of issues. The media has focussed mainly on last-minute drama over dispute settlement, the sunset clause, Canada’s cultural exception and supply management for the dairy industry. Both the PM and Minister Freeland have repeatedly stressed that “no deal is better than a bad deal” and that they will only sign a deal that is in the best interest of Canadians. But which Canadians? Much analysis to date has focussed on the deal’s impacts on commercial and corporate interests. Far less attention has been paid to the anticipated effects on citizens, workers, and the broader public interest. This blog reviews several of these less-discussed issues and assesses whether the Canadian government’s current bottom (or red) lines are the right ones from a public interest standpoint. The U.S.-Mexico accord scaled back ISDS between those two countries. Full ISDS will only apply to energy concessions, while a more limited version will apply in other economic sectors. According to press reports, the new deal could get rid of ISDS entirely between Canada and the U.S. NAFTA’s notorious chapter 11, which allows foreign investors to bypass the domestic courts and challenge government actions that allegedly harm their investments, has been repeatedly used to attack Canadian public interest laws and regulations, especially those protecting our environment. ISDS would remain in effect between Canada and Mexico. But because almost all NAFTA challenges against Canada have been by U.S. investors (and vice-versa), eliminating recourse to ISDS would be a substantial improvement over the NAFTA status quo and a key victory for North American social movements. It would not be hard to improve upon the hapless labour provisions accompanying NAFTA. The USTR summary boasts that the labour chapter “brings labor obligations into the core of the agreement (and) makes them fully enforceable.” Labour advocates who have seen the still-confidential draft are not fully persuaded it will benefit workers, especially without stronger enforcement. U.S. unions and Democratic Congressional leaders including Michigan’s Sander Levin have warned they cannot support the labour chapter without stronger enforcement. Until we can see the details, it is impossible to assess its likely effects. Predictably, Canada’s initial proposals to curb “right-to-work” provisions have fallen off the table, along with most of its much-hyped progressive trade agenda. But the new labour chapter includes a key annex that purports to address “protection contracts” between employer-dominated unions and workers. These contracts, widespread in Mexico, allow corrupt unions to sign long-term collective agreements without workers’ input or approval. The critical question is whether this and other positive-sounding language in the labour chapter will be enforceable. Stronger, enforceable labour provisions could provide a boost to the new Mexican government, which has pledged to reform Mexico’s repressive and corrupt system of labour relations. Outside support will be needed to overcome fierce, and potentially violent, resistance from the current employer-controlled unions and companies that benefit from this worker-hostile labour system. These companies include U.S. and Canadian multinationals. The Trump administration has focussed much of its attention on the auto sector, with the unabashed goal of curbing offshoring of manufacturing from the U.S. The U.S.-Mexico deal requires that to qualify for preferential tariff treatment, 75% of a finished vehicle’ content, a sliding scale of 60-75% for auto parts and a fixed portion of steel and aluminum must be made in North America. In a novel twist, to qualify for duty-free treatment, at least 40-45% of auto content must be produced by workers earning at least US$ 16 per hour. The U.S. has spun the new rules around wages as supporting U.S. workers and pressuring the industry to raise wages in Mexico. The key point to remember is that the penalty for not conforming to any of these rules of origin is to pay the MFN tariff, currently 2.5% on finished vehicles entering the U.S. Most analysts have assumed that if new rules of origin are too onerous or inconvenient a firm will simply opt to pay the tariff. The Trump administration’s threatened Section 232 tariffs on autos could alter that calculation. Mexico has reportedly already yielded (in a side letter) to U.S. pressure to impose export quotas and value thresholds on future vehicle and parts exports, beyond which the higher Section 232 tariffs will apply. Canada could well be under pressure to follow suit. What impact these new rules will have, if any, on future investment decisions and a possible rebalancing of North American auto production and jobs, depends on many complicated details that are still to be worked out. The U.S.-Mexico deal unexpectedly included a full intellectual property (IP) chapter, putting Canada in a difficult position. Until now, Canada has taken a strong position on IP, offering to adjust NAFTA to reflect WTO and multilateral norms, but rebuffing U.S. demands to adopt the extremely brand-friendly U.S. system of intellectual property protection. Mexico appears to have given up a lot, which could have dire consequences for access to essential medicines in a country where the average net household income is less than US$ 14,000 per year. The implications for drug costs in Canada could also be serious. The U.S.-Mexico deal extends monopoly protection for biologic drugs to ten years (Canada currently provides eight years of data exclusivity for biologics). Other provisions extending patentability, for example to cover surgical procedures, could also add to Canadian’s health care costs. Under CETA, the Canada-EU trade deal, Canada gave in to pressure to extend patent protections (so-called patent term restoration) for up to two years. The U.S. system provides for up to five years of patent restoration. Giving in to any combination of these U.S. demands could add billions of dollars annually to Canada’s already high drug costs, undermining the potential savings from the federal government’s pledge to implement a pharmacare program. Meanwhile, as IP experts such as Michael Geist and others have stressed, acceding to U.S-dictated intellectual property and digital trade rules could lock the Canadian economy into a dependent trajectory for many decades to come. While the costs are difficult to quantify, NAFTA 2.0’s intellectual property provisions are arguably far more important to Canadians’ future than NAFTA’s chapter 19 dispute settlement system. This brings us to Canada’s red lines. The U.S. has insisted on the elimination of NAFTA chapter 19 dispute settlement system. If it survives, it will almost certainly be in a weakened form. While the Chapter 19 dispute process has sometimes helped Canadian exporters, it was flawed from the outset and has diminished in effectiveness over time. Remands have been frequent, but effective trade relief much less so. If Canada is forced to let the dispute settlement system go, exporters will not be left completely defenceless against U.S. trade remedies. They will still have access to the U.S. Court of International Trade (CIT). Despite concerns about home bias, the CIT has the same powers as a panel to remand an incorrect decision. In both cases, the mandate is to ensure that U.S. trade remedy laws are followed. There are advantages to winning at the CIT over prevailing in the binational panel system. CIT rulings set binding legal precedents while panel rulings do not (leaving Canadian exporters to refight the same issues in future cases). Binational panel timelines have stretched out over the years, to the point that they are no faster than the CIT and, in some cases, slower. Chapter 19 has also proven incapable of resolving major trade disputes, such as softwood lumber. After years of the U.S trade authorities defying panel decisions, Canada was forced to negotiate a settlement. Perhaps, as some insiders suggest, the panel decisions strengthened Canada’s negotiating position, but the 2006 Softwood Lumber Agreement – which ended litigation only after Canada restricted its exports – was far from a Canadian victory. Chapter 19 provides no defence against the latest rash of U.S. safeguard actions involving steel, aluminum and potentially autos, which are based on specious national security grounds. The wisdom of Canada’s hardline defence of NAFTA chapter 19 is questionable. The Canadian government should quit fighting the last war over NAFTA chapter 19, especially if this can result in progress in other areas, such as fighting off costly concessions on intellectual property, protecting Canada’s beleaguered dairy farmers or gaining a meaningful cultural exception. The U.S-Mexico deal includes a diluted sunset clause, which has been another sticking point for Canada. On this issue, at least, Mexico has done the heavy lifting for Canada. The U.S. has agreed to a 16-year sunset clause (all parties must then renew the pact, or it expires). The deal also reportedly provides for periodic reviews, beginning after six years. Periodic reviews of trade agreements make sense and the pact will now not automatically be reopened while Trump is in office. The Canadian government should be able to accept these terms. The corporate sector may still grumble about alleged lack of investment certainty, but they will get little sympathy from the many Canadians living paycheque to paycheque in precarious work situations. At this moment, any analysis of the possible contents of a revised NAFTA must be accompanied by one huge caveat. Like dark matter–the invisible substance we suspect to make up 85% of the known universe–the bulk of the agreement remains shrouded in secrecy. Beyond the known sticking points, there are many important details that are unclear, undecided, or hidden. While rumours and strategic leaks swirl about possible last-minute trade-offs and concessions, the only public documents are the USTR’s terse and self-serving descriptions of the U.S.-Mexico agreement. As usual in trade talks, the Canadians public will not see the final text until it is too late to change it. In theory, Parliament and the provinces will have a say, but under a majority government anything agreed to over the next days and weeks will in effect be final. Add to this the indignity of negotiating with a gun to our heads and the democratic legitimacy of such a treaty is zilch. A new pact could be more of a mixed bag than previous trade treaties. Certain elements such as the partial elimination of ISDS, more effective labour protections and potential rebalancing of North American auto production and jobs, could bring benefits to workers and citizens. Yet none of these are a sure thing, and some or all may prove to be a sham. U.S. corporate-driven agendas such as the attack on supply management, excessive intellectual property protections and the erosion of our distinctive cultural industries and policies are both familiar and possibly more extreme than in previous treaties. There will also undoubtedly be some landmines buried in the text, for example, in the nebulous, lobbyist-prone area of regulatory cooperation. If worse comes to worst, Canadians can only hope that the Trudeau government is serious when it says it is ready to walk away rather than sign a bad deal.